Pippa Lee is a people pleaser. I get that; I do it all the time too. Still, while there is nothing wrong with considering the feelings of others, it does open the door to prioritize those feelings more than you would your own. Writer/Director, Rebecca Miller, has decided though that it is high time that her heroine take center stage in her own life and reveal the complicated, the repressed and yes even, THE PRIVATE LIVES OF PIPPA LEE. Robin Wright Penn plays the particularly enigmatic Pippa Lee and she does so with such a tender regard for her plight. Pippa is middle-aged but yet she finds herself calling a retirement village her new home so that the needs of her aging husband (Alan Arkin) can be met with more ease. She allows her daughter (Zoe Kazan) to treat her like garbage. She even lets her friends completely abuse her trust and compassion. For no obviously apparent reason, as seems to be the most common reason in cases like these, her mind can take her inadvertent abuse no more and a younger Pippa Lee (played in flashbacks by the surprisingly focused, Blake Lively) fights furiously to take back control of her life. Miller, who last directed her husband, Daniel Day-Lewis, in THE BALLAD OF JACK AND ROSE, has crafted a picture that is both poised and poignant. 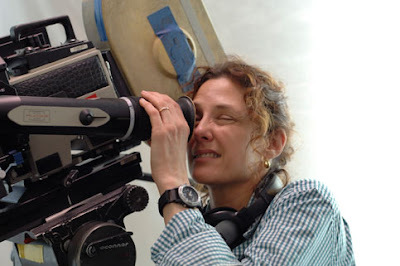 Thanks to her sensitive and delicate direction, the ensemble (rounded out by Keanu Reeves, Maria Bello, Winona Ryder and Julianne Moore) is able to create a circle around Wright Penn that is so strong and supportive, it allows for an actress who usually just fills out the circle to shine instead for a change. Subsequently, Pippa Lee gets the spotlight she has deserved all along.